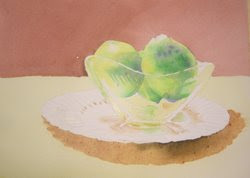 Here I have used the French Ultramarine Blue and Burnt Sienna in a very thin, watered down consistency to develop some of the reflections in the glass and added more color to the shadows in the lemons. I used the colors separately and mixed together in various mixtures to add depth to the shadows. I also used a very thinned out mixture of Aureolin Yellow with a drop of Burnt Sienna to paint the table area. I painted this mixture over the white of the table and over the previously painted shadow area under the plate.